LOT 401 - Oil on canvas signed Wiktor Korecki, 24" x 36", "Winter River". LOT 402 - Wood sculpture on stand 117/250 mono. Markus Pierson 1988, 18 1/2", "The Dip". LOT 403 - Painting on paper signed H.(Herbert) Siebner dated '52, 16 1/2" x 19", "Argeg.Lagodi Como.Italy". LOT 404 - Oil on canvas possibly signed Chas Collins, 16" x 20", "Village River scene". LOT 405 - Oil painting on canvas signed F(Fahri)Aldin, 23" X 17", "Man and Fish". LOT 406 - Oil on board after Rubens, 18" x 32", "Life of Maria di Midici"
LOT 407 - Oil on canvas signed J. (Jeffrey) Pratt, 30"x 36", "No55 a study of Poppies". LOT 408 - Oil on board signed J. Pratt, 6"x 20", "Lily Pond". LOT 409 - Limited etching signed "Hugh Mackenzie '90, 8 1/2" X 12 1/2", "Ramp and Cloud"
LOT 410 - Oil on canvas signed E.B. Warren, 20" X 30" "In Windsor Park". LOT 411 - Silkscreen signed (Daphne) Odjig numbered 18/75, 24"x20", "Eagle Dancer". LOT 412 - Silkscreen signed (Daphne) Odjig numbered 18/75, 24" x 20", "The Rhythm of the Drum". LOT 413 - Oil painting on canvas signed Wessling, 15 3/4" x 19 1/2", "July Landscape". LOT 414 - Watercolour signed P. Bouvier, 10" x 7","Lady Sitting". LOT 415 - Watercolour signed F.G.Newton, 7" x 10", "Interior Cottage Scene". LOT 416 - Oil on board sgnd. (Grant) Leier, 6 1/2"x 14 1/2", "Ain't No Way They Gonna Tax My Milky-Way". LOT 417 - Oil on canvas signed Terry Lee '87, 30" x 34", "The White Table Cloth". LOT 418 - Acrylic signed Kirkby, 14 1/2" X 26", "Inukshuk". LOT 419 - Oil on board signed Rogak (Helen), 20" x 26", "High Tide in The Cove". LOT 420 - Oil on canvas signed F.H. Brigden, 19"x 23", "Pastoral Landscape". LOT 421 - Watercolour signed T.E. Francis, 11" x 15", "Street Scene with Cathedral". LOT 422 - Oil on canvas signed L.Viorsky, 20 1/8" x 26 1/8","Travelling by horse and wagon". LOT 423 - Oil on canvas signed Aug. Legras, 20 1/2" X 28 1/2", "Fruit and Fish". LOT 424 - Mixed media collage board signed Fahri Aldin, 24" x 19 1/2", "Figure with Crossed Arms"
LOT 425 - Oil painting on canvas signed A.Young, 20" X 30","Heath near South Wales near Bracken". LOT 426 - Oil on canvas signed Dorus Arts, 12" x 16", "Gathering Faggots". LOT 427 - Oil on canvas signed J. Pratt, 24" x 30", "Wild Irises". LOT 428 - Oil painting signed Bepi Marino, 19 1/2" X 27 1/2","Rio Mendicanti, Venetia". LOT 429 - Collage signed Ina Uhthoff, 13" x 11 1/2", "Untitled- Underwater with Fish". LOT 430 - Watercolour signed P. Turner, 19 1/2" x 14 1/2", "Floral Study". LOT 431 - Oil on canvas signed on label Ion Gheorghiu 1969, 51 1/2" x 41 1/2", "Vegatatie". LOT 432 - Watercolour signed Harry Dunkin '88, 11 1/2" x 15 1/2", "Man with horse and binoculars". LOT 433 - Pair of watercolours signed A. Hopkinson, 10" x 8","Red Poll" & "Chiff Chaff". LOT 434 - Lithograph-Mark Chagall, 13 1/4" x 10 1/4", C.1960, "Job". LOT 435 - Oil on canvas signed Barton, possibly Donald B., 30" x 20", "Floral Still Life". LOT 436 - Oil on canvas signed A.K.Mailand, 27" x 39", "Geese over Wetlands". LOT 437 - Oil on canvas unsigned, 11" X 14", "Fall Landscape". LOT 438 - Watercolour indistinctly signed, 13 1/2" x 20", "Lighthouse". LOT 439 - Oil on canvas signed Dorothy McKay, 16" X 24 1/8", "Tofino". LOT 440 - Art pottery vase signed Dexter, 10" in height. LOT 441 - Oil on board in the manner of Maurice Cullen, 11 5/8" x 15 1/2", "Building -Cache River #2"
LOT 442 - Watercolour signed Harold Dunbar, 15" x 19", "Riverside Home". LOT 443 - Oil on board att. to Gustave de Breanski, 9 1/2" x 13 3/4", "Sailboat by Dock". LOT 444 - Pastel unsigned, 16" x 27", "Still Life Fruit". LOT 445 - Oil on canvas signed Galiard?, 20" x 24", "Forest Waterfall". LOT 446 - Oil on canvas signed Lee Reynolds, 40" x 50", "Desert Urban Scene." LOT 447 - Watercolour signed G.D.Markovich, 21" x 14", "Fire Department". LOT 448 - Charcoal signed Meri, 13 1/2" x 15 1/2", "Floral Study". LOT 449 - Oil on canvas signed G.(George) Jenkins, 22" x 43", "Coastal Scene- Breaking Surf". LOT 450 - Oil on canvas signed Henri Lorval, 24" x 36", "Ocean Scene". LOT 451 - Limited edition print signed (Jose) Trinidad numbered 149/590, "Flower Girl". LOT 452 - Charcoal signed Meri, 7" x 11", "Floral Still Life". LOT 453 - Oil on masonite signed H.M.Martin, 19 3/4" x 28", "Arrow Lakes". LOT 454 - Watercolour signed Heine, 13" x 20 1/2","Fisgard Light". LOT 455 - Oil on canvas signed Henri Lorval, 24" x 36","Ocean Scene". LOT 456 - Watercolour signed Henry Harris- Clifton 1875, 6 1/8" x 9 1/8", "Crossing Stream". LOT 457 - Oil on board signed Darling, 6" x 8" 1/4", "Walking on Path". LOT 458 - Oil on panel signed Darling, 6 1/4" x 8 5/8", "Figure by a Stream". LOT 459 - Pair of oil on boards signed Little, 15 1/2" x 19 1/2", "Mountain Lake" & "Saskatchewan River". LOT 460 - Oil on canvas signed Eliza H. Hawkins, 24" x 18", "SPRING, tra-La". LOT 461 - Oil on canvas signed Henri Lorval, 16" x 31 1/2","Ocean Scene". LOT 462 - Oil on board signed Campbell dated '71, 24" x 48", "Forest Stream". LOT 463 - Charcoal sketch signed Jack Wilkinson '65, 19" x 10", "Marie in Rocking Chair". LOT 464 - Abstract charcoal signed J.C.S. Wilkinson, 21 1/2" x 16 1/2", "Dancer". LOT 465 - Oil on canvas signed Ken Faulks, 30" x 20","The Model". LOT 466 - Ink drawing signed Korner dated '75, with dedication,10 1/2" x 7 1/2", "Vancouver". LOT 467 - Pastel signed M.(Margaret), Bonneau, 18 1/2" x 15 1/2","Morning Light". LOT 468 - Oil on paper follower of Emily Carr, 18" x 12", "Red Cedars". LOT 469 - Oil on canvas signed Rose, 12" x 16", "Chatting". LOT 470 - Oil on board signed R.Forrest, 15 1/2" x 19", "Going Fishing". LOT 471 - Pair of watercolours signed Sue Coleman, 8 1/2" x 11 1/2", "Cabin" and "Barn". LOT 472 - Oil on board signed E.Embler, 15 1/2" x 31 1/2", "Lake and Trees". LOT 473 - Watercolour signed John Herreilers, 12" x 16", "Ducks in Wetlands". 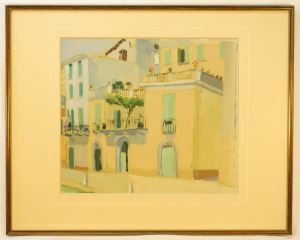 LOT 474 - Watercolour signed Brenda Cooke, 16" x 12", "Street Scene". LOT 475 - Watercolour signed Miriam Thorn, 13" x 20", "Ice Emergent Aquarelles". LOT 476 - Oil on board signed A. Rockett, 16" x 20", "Cabin with horse in winter". LOT 477 - Small 19th. century unsigned oil on board, 3 3/4" x 5 1/8", "Tavern Scene". LOT 478 - Oil on canvas signed KW '93, 16" x 20", "Chatham Island". LOT 479 - Limited edition print signed R.(Rod) Charlesworth numbered 190/295, "Soccer in the Garden". LOT 480 - Oil on canvas signed A.K.Mailand, 31" x 46", "Pheasants over Countryside". LOT 481 - Oil on canvas signed P.Revard dated '96, 11" x 14", "Egg Plant and Pears". LOT 482 - Watercolour signed Brenda Cooke, 12" x 16", "Coastal Scene with boats". LOT 483 - Oil on board signed Lau, 18" x 24", "Coastal Scene". LOT 484 - Oil on board signed D.J.Smith, 16" x 12", "Woodland Stump". LOT 485 - Acrylic on board signed J. Slagboom, 9 1/2" x 13 1/2", "Esquimalt Lagoon". LOT 486 - Coloured print signed Irene Hoffar Reid dated '72, 24" x 16", "Princess Louise Inlet". LOT 487 - Embossed Ltd. Ed. lithograph signed Alvar, 19" x 27 1/2","Le Peintre et sa Realite". LOT 488 - Watercolour signed Fred D Penney, 20 1/2" x 16 1/2", "Lake at Hermet - California". LOT 489 - Oil on canvas signed W.W.Holmes, 18" x 24","Stone Bridge". LOT 490 - Watercolour signed Owen Goward, 17" x 24 1/2","Ship at Dock". LOT 491 - Water colour signed Joseph H. Ross, 7 1/2" X 10 1/2", "Fall Stream". LOT 492 - Oil on board signed Myfanwy (Pavelic), 25 1/2" x 39 1/2", "Portrait of Jack Kidder". LOT 493 - Watercolour signed Susan Heller 1977, 21" x 18", "The Little Chapel at Kilarney". LOT 494 - Oil on canvas signed E. Grundstain 1951, 28 1/4" x 18 1/4", "Nurnberg". LOT 495 - Poster print signed Henry Moore, 35" x 16", "Art Gallery of Ontario - Toronto". LOT 496 - Oil on board signed H Amster, 16" X 20","Dutch Canal Scene". LOT 497 - Watercolour signed Tos-que(David Williams), 14" x 19". "When Game was Scarce". LOT 498 - Oil painting on canvas signed JCS Wilkinson '70, 30" X 25", "Bill Patterson & Leonard"
LOT 499 - Oil on canvas signed K (Heather Keenan),38" x 48","Ascent". LOT 500 - Pair of watercolours signed Joan Needham, 13 1/2" x 11", "Family by the shore". LOT 501 - Oil on board signed A. Wadham Sinclair, 301/2" x 20 1/2", "Forest Mountain Landscape". LOT 502 - Pair of watercolours signed A. Hopkinson, 8" x 10","Chaffinch" & "Yellow Hammer". LOT 503 - Engraving signed in plate Manet, 5 1/2" x 3 1/2", "Charles Baudelaire in hat". LOT 504 - Limited edition print signed Cameron Thistle numbered 3/475, "Coastal Window View".